Home → Cryptozoology → Does Bigfoot Exist? OK, so do you believe that Bigfoot exists now or that it ever did in the past? Why do you suppose no remains have ever been discovered (or have they?). How could such a creature hide for so long? Why is Bigfoot always blurry? yes it does. your know why? Big foot is really a demon. it comes in and out of another dimension just like ghosts. I know because my dad talked about seeing Big foot in Gordon Wisconsin and Dairy Land Wisconsin. I published a story about what my dad said. called Astral Body Projection and contact with Aliens. So… you people believe in the new age movement eh? You know this primitive superstitious religious beliefs has been the main cause of death and suffering throughout history. It doesnt have to go on. I cind of just started believing that everything every boddy say exist but is never ever found, is actualy demons taking on shapes of things that attracts peoples attention. Well I think you get the idea. That is what I believe until eneyboddy can give me rock soled prove of its existance. Harry Potter movies is a good example for all these strange cretures. Mm. Bigfoot as a demon is a tantilizing thought. But I can’t exactly agree with it. Not at all, actually. Demonic Presences are much, much more vile than simply scaring a camper or two. Bigfoot, in my opinion, is a North American Great Ape. I spend a lot of time doing paranormal and cryptozoological research and have had a handful of encounters with various things, twice including Bigfoot. I think we’re looking at a subspecies of Gigantopithicus that migrated over the Bering Land Bridge 100 thousand or so years ago. They are a relict species that has been able to, if barely, survive in the more remote and heavily wooded places across the continent. I think, though, that we’re looking at only a handful, six hundred or so animals and they are dying out. This question may never really be answered because of a possibly extinction and if we did find out it was real in the next ten years, it would be too late to keep the species alive and would face extinction. Earth is a young world and a lot has come and gone. It’s a big place and it’s easy to see that these creatures would be hidden, especially in the Northwest. I agree with you. Bigfoot is not a demon. They are all ‘elementals’, natural species of nature and the planet. They mean no harm, we are just destroying their environment, and I understand when they object. I have met annoyed elementals .. they are incredibly powerful, and gloriously beautiful, and also part of God/Spirit’s creations. I went back and read the question again. Remains have been found. Tibetan monks have them, some proved to be unexplainable, and some proved to be goats and things. We (people) also have a variety of footprints in strange and enormous sizes .. including human created dopey ones. How can they hide for so long – there’s a lot of forest out there .. and there is not just one type of bigfoot .. we also have the ‘yowie’ in a Australia, another ‘myth’ that people swear they have encountered. The tibetan bigfoot is also different to the american one, I believe. @Ama:”They mean no harm…. and gloriously beautiful, and also part of God/Spirit’s creations.” Yeah, I agrre with you, Ms.Ama. I have lived with one of them for so long. She is a very helpful companion and very kind to me. Although most of my family still don’t accept her to live with me. Maybe, because elementals already labeled as “dangerous” or maybe because we are from different species, so they think it’s impossible for us (human) to get along with them (elementals). I hope, in the Future, All Creatures can live together again, peacefully, like what they do at the dawn of time…. P.S. Sorry for become poetic or maybe a bit cryptic, but you must be know what I mean…. Your wish is wonderful, Adhinferno, a good life, and all of us living in harmony. I am curious to know more about your companion? “with our thoughts we create the world” .. always loved the Buddha’s teachings on that. I want a world where everyone can believe in a Deity of some kind, a good, loving one .. without being hassled by living humans, or nasty entities. Some people believe these supernatural beings were actually angels that followed lucifer in rebellion and when they were thrown from heaven just before reaching hell. Jesus held up his hand and the easily swayed angels not wholly responsible for their actions (being duped by luckfer) stopped and thus were left between heaven and hell here with us. Anyone else ever hear that theory. Another about the iron to keep faeries away such as the nail in the crib to protect your babies. If going into a faeries home wedging the door open with iron…..etc. If bigfoot is real…there is a good chance they have a reason to stay hidden. If no one has seen or captured one on real film maybe there is a reason they arent shown. I would be interested to know where you got that story from, because I have never heard it at all, nor read it anywhere, and I’ve been researching the subject for many years. Fascinating! There’s a good explanation for the iron .. if I could only remember what it was. LOL Must look it up later in the day when I have more time. But I doubt anyone can go into a fairies home, nor should they .. according to legend their ‘time’ and ours are completely different. You go for a day, come home and anything from a week to a year, or 100 years, has passed here on earth. Bigfoot may very well be real. However as more and more of the natural habitat associated with the creatures disappears, the more unlikely it seems that Bigfoot exists. The video used for the picture above is a hoax though. If you watch the video it seems clearly fake. The limbs, primates have MUCH longer arms than humans in proportion to the rest of their body, in that video it has human sized everything. It looks to me like a guy in a monkey suit, exaggerating their walk by swinging their arms. 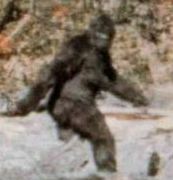 But Bigfoot, Yeti, Sasquatch, whatever society calls it, has been around in a mythological sense for a very long time. In my opinion it’s a “no smoke without fire” situation, why would someone imagine or make up such an idea out of nowhere? And people living in different time zones, thousands of miles apart coming up with such similar ideas seems more ridiculous to me than the concept of a yeti being hidden in the middle of Piccadilly Circus. big foot was seen on the othere side of the world and spoted in bc canada in the 1980s near the big hills i call it. dont think i would want to come face to face with it watch the tv show destanain truth they found track of big foot……. Is there anyone here who ALSO does NOT believe in ghost/demons/fairies and J.R. Tolkien creatures? Elementals? You’ve met them? Paleeze..
As a regular, down to earth, agnostic, believes in the scientific theory SANE person, I am not trying too hard to believe or dis believe.. I only want the truth, not what I “feel” or “want” to believe in, no matter how “neato” or magical it seems. Anyone here have a LOGICAL mind, grounded in scientific fact? Evidence, please. Every single one of you here takes any legitimacy and credibility away from it being real. You all seem to want to believe in anything and everything. BigJim- Yours is the only answer that made any sense. BekkieLassy- please tell me English is not your first language. Be anything other than an American over the age of 6 please. Does realism always include rudeness? If you want to have a go at my beliefs, go ahead, I’m a big girl, I can take it. I can also hand it back .. but some people might not have had the benefit of your education, or mine, and so spelling is a challenge, but they can explain themselves very clearly, in my opinion. Where do you think JR Tolkien, a man I am told was very devout Christian, btw, get his ideas from .. if not the mythology of Men, the history of WW2 and the Bible? And how much of mythology is based in truth? We can’t know, we didn’t live in ‘those times’ .. so you’ll find no proof unless someone builds a ‘real’ time machine .. and I think the scientists are trying to that right now! You asked about a logical mind. I can put up my hand. My ‘logical’ brain gets in the way of my spiritual practises. LOL I have to have questions answered, by the angels, and touch the beings that turn up .. blue skin and all. And yes, I’ve held elementals hands, and so did 3 other people in my group at the time, and one ‘lady’ elemental even stopped my car from moving one day. It’s a 6 cylindar commodore … big car by Australian standards. So please, stay and debate it all with us if you want to, but don’t judge a person’s capacity to ‘know’ things on their ability with the english language. And we love BJ’s stuff too. Ama, I’ve got a unicorn for sale if you’re interested. Just don’t touch the horn- it might fall… Um, I mean it’s magical, and could do strange things if you touch it. on tv ,finding big foot one lady said she saw bf a limb that was to weak to support its weight with glowing green eyes .sounds demonic to me !